Some of this stuff is old news for you hard-out web surfers out there but after spending a few days in the Crank Brothers FJ, I can show you some of the swanky new stuff they have on offer for 2011/2012. There's new and redesigned wheels, new saddles, new pedals and finally some wider handlebars. Although the bars pictured are only 680, Crank Brothers have finally realised that today's mountain bikers want the possibility to run bars wider than 700mm and to that end are now offering the Iodine and Cobalt bars in 720mm and the Sage and Opium in 780mm width. The bars are graphically pretty much the same, rocking the sweet brake and shifter guide markings which are pretty damn cool. The grips are staying pretty much the same. New for 2012 is the Iodine all-mountain saddle. For a saddle it's pretty trick; it's got simple replaceable rails—just one Torx bolt and they're off—then there's the soft bendy nose of the saddle for a bit more comfort when you slide to the front for that pinch climb. There is an 11 (239 grams) model and 3 (283 grams) model. Pedals are kind of a big deal for Crank Brothers; I mean it's what made their name and of late it's what's lost them a bunch of customers. In 2011 we saw the introduction of the revised Candy and Eggbeaters and now for 2012 we're seeing the whole line get the treatment with new 5050 and Mallet models. Both pedals are huge departures from their predecessors and now feature the split design similar to the Candy. The price point orientated 1 is all polycarbonate, whereas the 2 and 3 are both half polycarbonate half alloy. The 3 features a cast Eggbeater cleat and outboard needle bearings as well as a 5-year warranty. The 5050 gets three models for 2012, pretty similar to the Mallet in that the 1 is all polycarbonate and the other two are mixed materials with the three again getting an outboard needle bearing. And then we have the revised wheels. 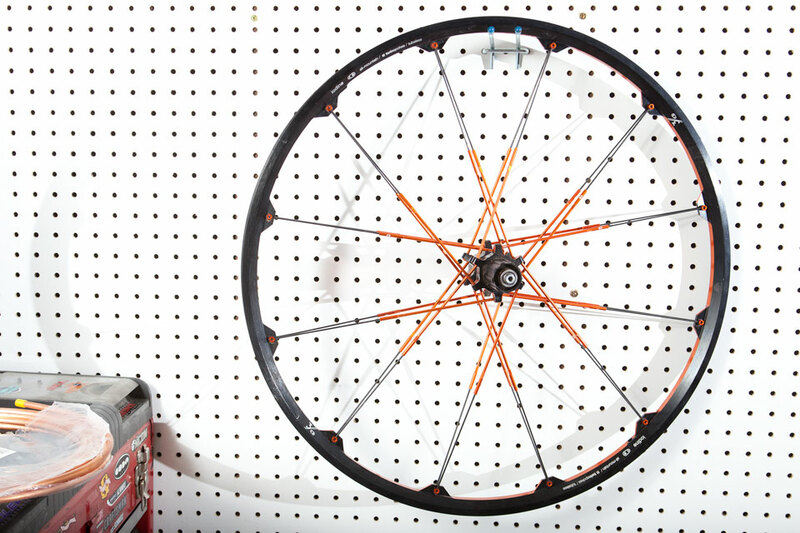 All new Crank Brothers wheels feature new Freehubs and internals as well as a more subdued graphics update, which also saves weight in its two step anodising process. The spoke pins are now hollow, the excess metal has been shaved off the rims, and the spine has been strengthened. 200 grams has been shaved off the previous version Iodine and it's now available in three colours. The price point Cobalt gets much the same treatment as the Iodine but not quite as much weight is saved, only stepping down 40 grams from its predecessor. Pictured is the flashed Cobalt 3 which features the double anodising (not available on the 2) as well as four sealed cartridge bearings. So that's everything that was in the FJ. There are other flasher things out and about from Crank Brothers' 11 range, but they are pretty damn pricey and we weren't sporting them in the truck so I can't really tell you that much about them. I did spend a few days on a set of Cobalt 29" wheels which held up well to four intensive days of Colorado/Utah riding, but I'd need much more time on them to give you a full blown account/review.